We have taken a look at this letter and highlighted important bits below. Worth noting is the attorneys’ concern about the reputation of the Office and the lack of action from the Administrative Council. On behalf of the Dutch Institute of Patent Attorneys or Nederlandse Orde van Octrooigemachtigden (Orde), we want to draw your attention to the following issues. 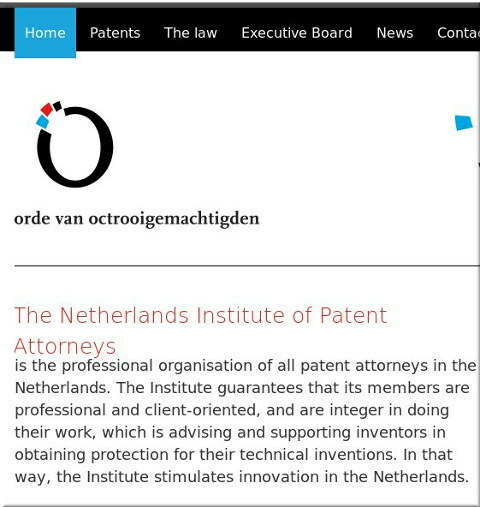 The Dutch Institute of Patent Attorneys is the professional organisation of Dutch patent attorneys. The existence of the Orde is enshrined in the Dutch Patent Act and membership is mandatory for all Dutch patent attorneys. Our members (around 500) are active in private practice as well as in the industry. Most of our members are also European Patent Attorneys and act regularly before the EPO. The European Patent System is on the brink of a new era. The Unitary Patent System (UPS) and the associated Unitary Patent Court (UPC) is a new and significant step forward. It will improve the patent system in Europe and make it more reliable and attractive for its users, both legally and economically. In particular, the UPS/UPC intends to make Europe more attractive compared with the other major patents systems such as those of the United States, Japan, China and South Korea. The Orde believes that such enhanced cooperation is the way forward in a globalising economy wherein the value of an enterprise more and more relies on the value of its intellectual property. We fully support and endorse such endeavours. The Orde understands that organisations such as the EPO have to reinvent themselves from time to time in order to remain state of the art. The Orde applauds the ambition of the EPO to “set worldwide standards in quality and efficiency“(source: EPO vision). The existing roadmap to achieve this (the ‘why’ and ‘what’) is not disputed by us. We believe that indeed the EPO can be a leading patent office in the world. We notice and acknowledge that the EPO has been able to substantially improve the speed and quality of its patent processes as well as the communication with its users (applicants/patent attorneys). However, the Orde has to express its serious and on-going concern about the way in which this reinventing process is taking place and the effects that it has on the image of the EPO. The Orde follows with growing worries the developments at the EPO. In particular, we are concerned about the developments regarding the organisation and government of the Boards of Appeal and the treatment of the EPO personnel. It is the ‘how’ that now brings us to this letter. We observe that the reorganization process towards increased independence of the Boards of Appeal is not progressing or too slow. Earlier proposals for reform by the President do not guarantee adequate independence. The undesirable lack of independence has also been found by the Enlarged Board of Appeal. The observation that the President does not appear to listen to the valuable input of the Boards (who have been qualified one by Sir Robin Jacob as “judges in all but name”), is a striking denial of their qualities. The Orde is of the opinion that Boards have a crucial role in determining the validity of European Patents. Consequently, the impartiality and independence of the Boards of Appeal without any interference or control of the President of the EPO is essential for the proper functioning of the EPO judicial system. Now and in the future. We observe in the 2016 EPO Business Distribution Scheme of the Technical Boards of Appeal that there are about 10% vacant positions in Boards of Appeal in 2016. More than 25% of the boards seem to be without chairman, effectively deactivating the Boards in question. We observe that there is no apparent reason for doing so. The Boards have an essential role in preserving the quality of the European Patent System. Their role in the Unitary Patent System remains crucial and must be properly facilitated. With the current understaffing of the Boards, we are worried that appeal procedures will be unduly delayed, creating legal uncertainty and adversely affects the quality of the European patent system. The Orde is of the opinion that the quality and staffing of the Boards of Appeal is to be maintained. We observe that the employment conditions at the EPO and the basic rights of employees are seriously compromised. In the beginning it appeared as common and understandable reactions to changes that every organisation experiences. However, over time the information that reached the public became more and became more serious. The latest incident being that officials of SUEPO are subjected to disciplinary measures, downgraded, pension reductions and some SUEPO members plainly fired. We have already seen that any form of normal communication between SUEPO and EPO is severely flawed or is non-existent. We see many reports of oppressive rules and regulations. We note that, when we seek information from EPO employees, they are reluctant to communicate in fear of retribution by internal investigative units. It seems that the people at the EPO are afraid of their own management. The Orde rejects this situation vehemently. We cannot understand that the President of an organization that envisages to “set worldwide standards in quality and efficiency“ is not capable or not willing to apply the same standards to its people management. We refer also to the ruling of the Dutch Appeal Court that the EPO appears to be violating basic human rights. A disgrace, irrespective whether the EPO benefits from its immunity as an international organisation or not. A reputable international organization such as EPO should not have it’s employment conditions and employee rights held up against such a basic thing as human rights. We observe repeated demonstrations of large groups of EPO personnel in Munich or The Hague. We know many of the employees of the EPO. Either from a professional relationship as examiner or because many of them live among us in the Netherlands and we share schools and clubs with them. We know that they are highly motivated, highly intelligent, capable and reasonable people that care about the patent system and the organisation they work for. We hear that most of them understand the ‘why’ and ‘what’. The observation that they demonstrate repeatedly in large groups is nevertheless a clear indication that they are unhappy. They do not deserve to be led by a President who, regardless of other qualities, seems to have an intolerant and destructive people management style as part of the ‘how’. We call upon the Administrative Council to instruct the President to acknowledge and normalise the basic human right of the EPO employees to organize themselves and come up for their position. The reinvention process of the EPO should be a firm yet healthy discussion between management and employees who, in the end, have the common interest of the organisation at large in mind. We observe also that the dispute between the President and the EPO has attracted the public interest already more than once. The EPO does not live in a diplomatic vacuum. The EPO is part of today’s society and everything that that happens inside the EPO will find its way to the outside. Very quickly and very complete via internet and social media. Various newspapers and TV-programmes have paid attention to the quarrels at the EPO. In addition to the information from public media, we receive information from our members that that they are increasingly being questioned about what is happening at the EPO. These questions come from their foreign colleagues (patent attorneys around the world) as well as direct clients, i.e. inventors and applicants. These people are the primary clients of the EPO and they wonder what is going on. The fact that the Orde is a Dutch organisation does not make a difference for our clients, our members also act before the EPO. For our clients and applicants, we are all part of the same patent system. These observations and questions from clients and applicants mean that the credibility and reputation of the EPO is already tainted in Europe and abroad. The Orde does not see this as a healthy situation. The Orde is of the opinion that the role of President of the EPO also contains the responsibility of maintaining and furthering the reputation of the EPO for the general public. We are of the opinion that the current situation demands serious and concrete efforts by the Administrative Council to stop the President of the EPO from continuing these unproductive and destructive practices. We call upon the Administrative Council to take up its responsibility, to supervise the EPO and take control of the situation. EPO Social Workshops on Monday and Tuesday? No, EPO Staff up in Arms!